Born in 1982, Yang Jung-uk is an artist loaded with stories that have become ingredients for his works of art. Yang does not borrow from a grand scheme of discourse or critical theories distant from himself. Instead, the artist makes full use of details collected throughout his life. Yang is holding an exhibition at Gallery Hyundai that began Feb. 28 and runs until March 27. 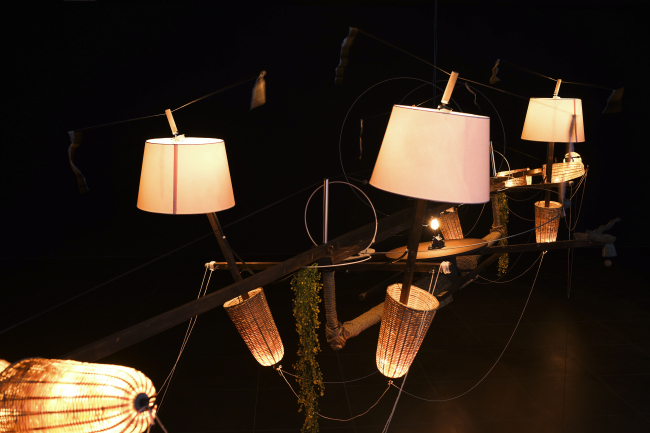 The exhibition introduces 17 installation works he has produced in recent years -- the highlight being his signature kinetic sculptures ornamented with lights and found objects. The exhibition’s first floor includes sculptures inspired by scenes and moments of people taking group photos -- his most recent series. “I think it is important to tell stories right, even if the story is a trivial one. I don’t have to borrow a huge discourse to explain my works. I just focus on making artworks with my own stories and explain them with my own words, but not those by others,” Yang said in a press conference held on the sidelines of the exhibition on Feb. 28 at Gallery Hyundai in central Seoul. Yang said he always writes first before transforming the stories into works of art. Yang’s mind constantly labors to recollect details from his past and reproduce them in the form of his art. “My parents ran a small convenience store, and I sometimes had to work part-time there. There, sitting in a small-sized square, I felt I could make up an infinite amount of stories. I started to write things around then,” Yang recalled. The artist has a keen eye for details, an ability he honed in his youth when he aspired to be a fish seller. “I have a memory of a fish seller who was very fast in dressing the fish. The fish seller neatly cut off the head of fish and rid the scales. The ways of using his hands seemed perfect. ‘That’s what a grown-up looks like,’ I thought,” Yang recalled. Yang selects materials for his works by heeding to his surroundings. Normally, he is fond of objects and materials that have stood the test of time, that carry a sense of the past. He has a special attachment to old objects with a part missing, or that have worn out. For his installation series titled “Friends Who No Longer Meet,” he used materials he disliked. “For the friend series, I have used materials that I don’t like. I thought they might be appropriate to express the friends that I don’t like,” Yang said. Yang’s kinetic installations from “Friends Who No Longer Meet” are humorous renditions of people he used be friends with, but has since parted ways with. One of the works portrays a friend with a keen interest in hairstyles. The friend, however, continued to meddle with Yang’s hairstyle. Another work shows a friend with a great interest in health products. It shows the friend’s obsession with the artist’s teeth, which later sparked an argument and also a falling-out. While he has turned his memories of friends into sculptures, “Scenery of Dialogue No. 2: Speaking of Something When the Sun Goes Down” is based on actual dialogue with his wife. “It has been a year and a half since I have been married to my wife, and about 10 years since I have known her. But, we still have areas in which we argue, like decorating our place. We have different tastes, and sometimes that initiates an argument. The argument would sometimes become fierce, but then there would also be a pause when you step back,” Yang commented on his large work ornamented with lamps with different lightshades, artificial flowers and a bell. “When the sun goes down, you turn your lights on. To do so, you need light at your place. My wife and I once talked about what kinds of lamps we were going to get, like about the color of the light or shape of lampshades. This work is about the back and forth of the dialogue we had on that subject,” Yang explained. 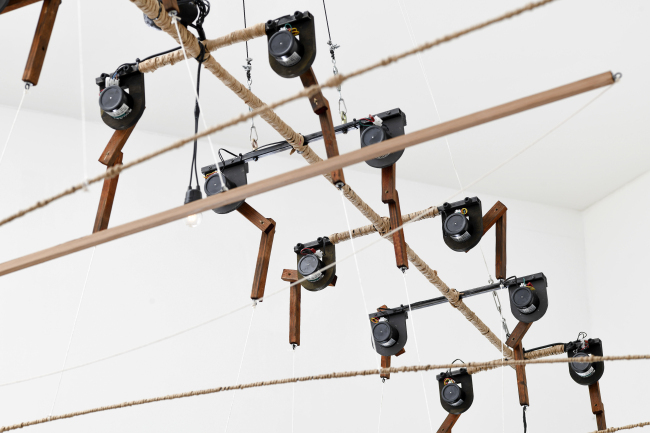 Balance is as an important concept in creating his kinetic sculptures, the artist said as he delved into why his kinetic installations are in constant motion. “I am an artist but also husband to my wife, representative of my own business and so on. In the past, I thought I will achieve a certain balance if I equally distribute my energy. But it turned out that I was mistaken. ‘balance,’ to me, seems more about actions. Balance is not a status, where everything stands still, I found,” Yang continued. “I once did a project with choreographer Choi Eun-jin, whom I asked to stand balanced on the circular panel I created. She had to constantly move as the panel slid whenever she tried to regain her balance. I thought the status of constant motions to achieve balance is closer to so-called ‘balance’ than status of being still and parallel,” Yang continued. “The Balance Artist Has Never Slept” deals directly with his concerns about ‘balance,’ which always lingers in his head, Yang said. 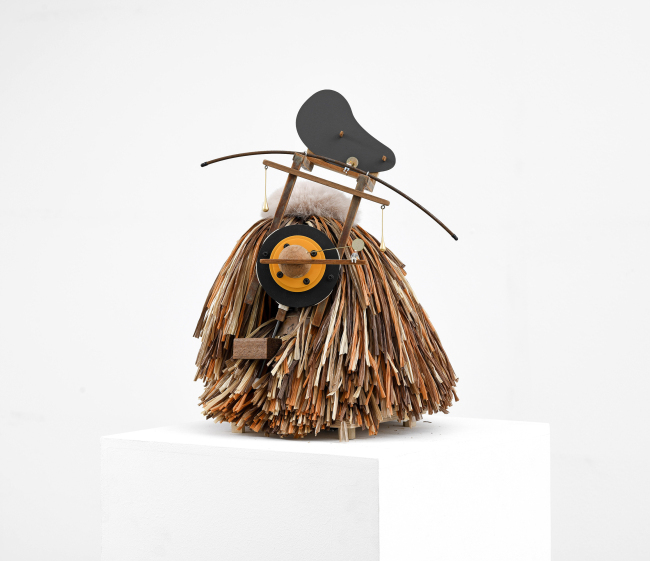 When asked about the likelihood of whether visitors could read into embedded personal stories from his abstract kinetic sculptures, Yang said the titles work only as guidelines. “I think the viewers will find their ways with the titles. If not, no worries. My only job here is to make the viewers to imagine stories in their own ways,” Yang said. “I teach children. In the classroom, for instance, I show scissors and I ask them to say anything about the object. But, they are not allowed to say something that has been previously mentioned. In the very beginning stage, they talk about functional aspects of the object, like we would normally think. But, those kinds of answers soon run out. Then, they start imagining, to look beyond the scissors in front of them,” Yang said. Yang’s exhibition is also, perhaps, a classroom, where visitors see in themselves how sensitive they are to the subtleties -- and how imaginative they really are. The exhibition runs through March 27.